There are fewer than four weeks until the regular 2017 session ends, and we now have budgets on the table from both the House Democrats and Senate Republicans. While each proposal addresses education and tax reform, the differences in what is funded and who pays are stark. 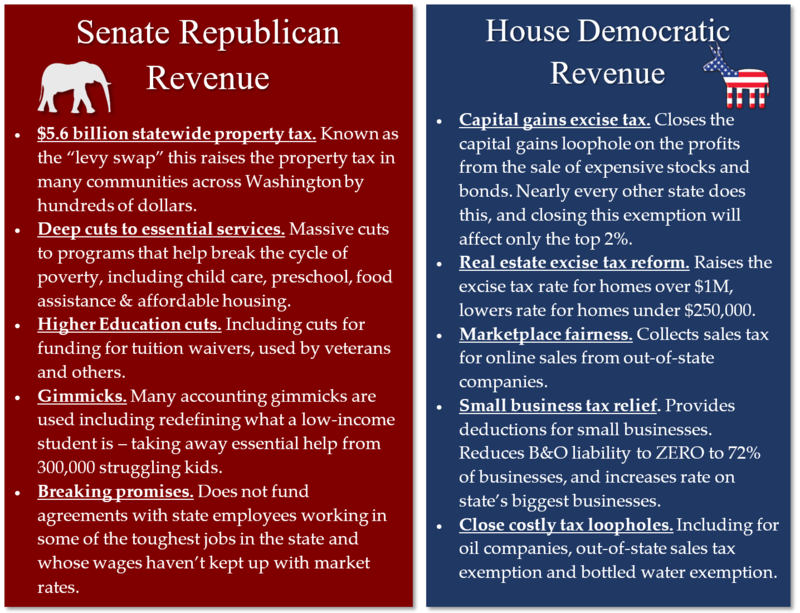 Senate Republicans fund their budget by creating a new $5.6 billion property tax while also making deep cuts to essential services that help families break the cycle of poverty. Republicans also make a significant cut to family planning funding and reject $1.5 billion in assured federal funds for low-income health care programs. 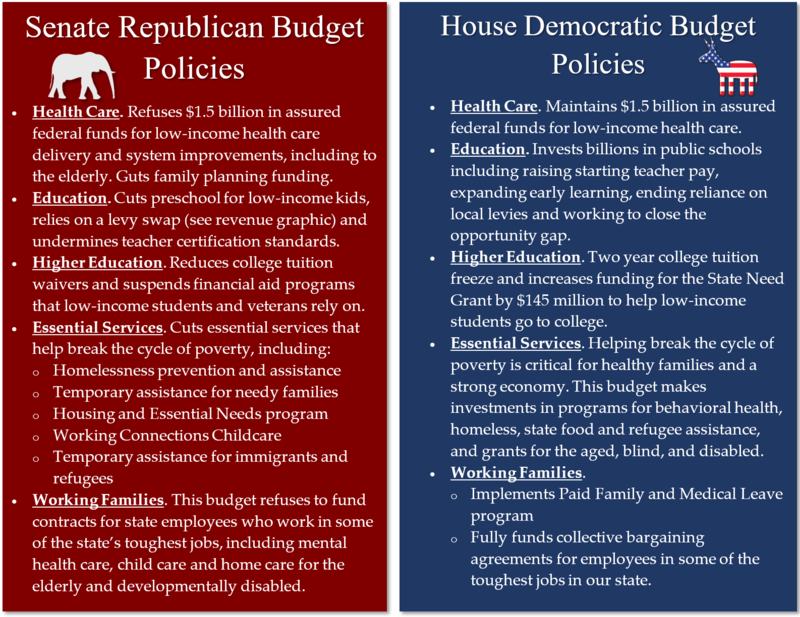 House Democrats on the other hand have released a budget that puts significantly more money into public schools in targeted investments, and funds their budget by closing costly corporate loopholes, closing the capital gains excise tax loophole and creating a more fair real estate excise tax system. While no budget is perfect, our state has the most upside-down tax system in the nation and we need to be making changes that fund our responsibilities while not further burdening working families. I will continue to fight for full and fair funding for our schools and responsible government that keeps people at its heart. As always, please contact me with questions or concerns. The operating budget is the main budget for the state. This funds everything from public schools and universities to state agencies and the mental health care system. You can view the operating budget here. The transportation budget funds everything from pedestrian safety improvements, ferries, traffic improvement projects, to avalanche control on the mountain passes. You can view the transportation budget here. The capital budget funds a variety of building and maintenance projects throughout the state. 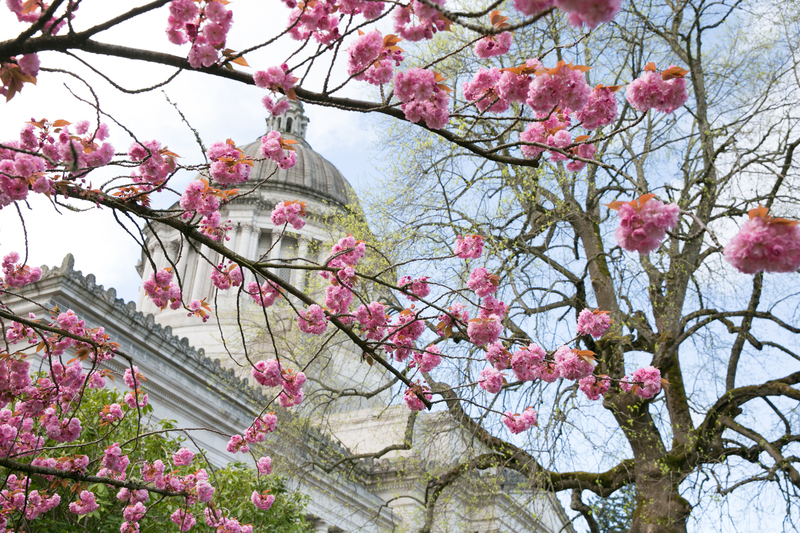 From affordable housing grants to schools and community and arts centers and parks, the capital budget is critical to building and expanding public spaces throughout Washington state. The capital budget passed out of the Senate unanimously. You can view the capital budget here. Students from across Washington came to the Capitol one day last week to demonstrate the skills they are learning in their career and technical education classes (CTE), and the important role CTE plays in their lives. 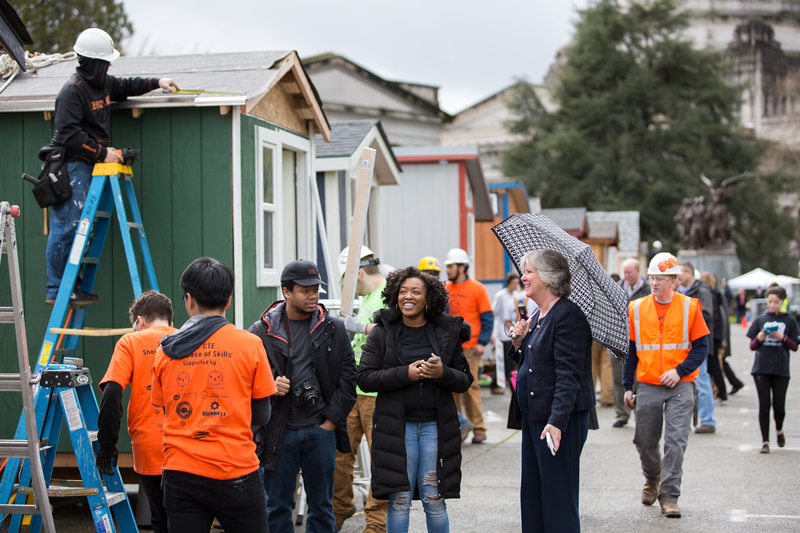 Dozens of high school students from Aberdeen to Walla Walla showed off a very impressive array of skills and knowledge by building tiny houses that will be donated as housing for homeless people in Seattle. Not only was it a great demonstration of their CTE skills in engineering, design, building and art, it also taught the students about our growing homelessness crisis in Washington and the creative solutions communities are developing to address it. For more on CTE, click here. 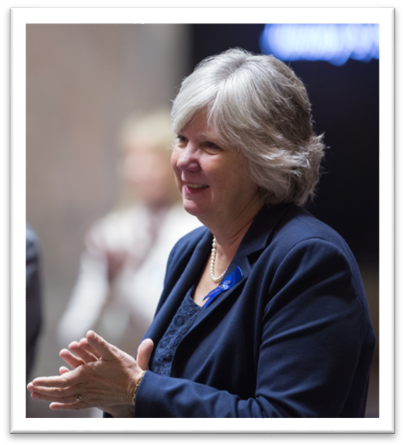 I had the great pleasure last week of offering a resolution in honor of the vital work done by the staff and volunteers at the West Seattle Helpline. Families in our state are increasingly one crisis away from homelessness. For people in our region, the Helpline offers a variety of services and even steps in to offer emergency assistance to our neighbors who are struggling to make ends meet. Their model of “neighbors helping neighbors” is key to turning the tide of homelessness in Washington. I want to thank everyone at the Helpline for their service and the hard work they do. To read the resolution, please click here. To read a recent article about the resolution, click here.